News, Notes, and Random Musings From the New World! : The Other Half Checking In - Heroes Con Art! The Other Half Checking In - Heroes Con Art! New World Angi here dropping in to say hey and thanks for dropping by our spot on the Internet highway. I have some fun items to share from the recent Heroes Convention in Charlotte, NC. As has been said in many other places, Shelton Drum, Dustin Harbin, and company put on what is probably the most fan friendly pure comic convention in the country. If you are used to the giant media shows of SDCC, NYCC, and Wizard (boo! hiss! ), this will be a great treat for you. The fan and creator interaction is incredible (ask us about Chris Claremont's five minute song about the X3 Beast bust and Kelsey Grammar sometime). Muppets and Dr. Who - what more can you ask for? Featuring Dr. Bunsen Huneydew as 4th Doctor and Beaker as the 2nd Doctor, this lovely piece had quite a lot of interest and drew compliments on the show floor on Sunday. 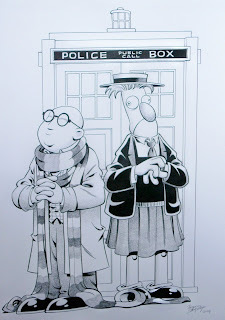 Done by Roger Langridge - I am incredibly delighted to have it our collection. Mr. Langridge did a Gonzo as Davros sketch for us the next day to go with this. He is the current artist on Boom Studios hot and better than it has any right to be "Muppet Show" comics. Take a look at his website here.. 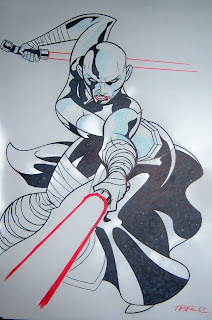 The nice large piece of Star Wars character Asajj Ventress is by Tim Fischer (we think). It is going to be displayed along with a Dave Dorman Darth Vader and Bernard Chang Queen Amidala of similar size and also from previous Heroes art auctions! (note from New World Mike - yes, this one is for me. Lightsabers....oooooooo) Check out Tim's website here. Tim, if this is not yours, let us know! If it is, let us know!